Nian gao or New year Cake has always been and still is a favourite among Chinese during the Chinese New Year. Every family will buy or make these sweet nian gao to celebrate the new year as this auspicious sticky rice cake symbolises prosperity and good luck for the year ahead. So what do we do with the extra leftover of the nian gao after the new year? One of the simplest, healthiest and classic way is to steam and then roll the soft nian gao in aromatic grated coconut. Steamed nian gao is served as a sweet dessert or snack. 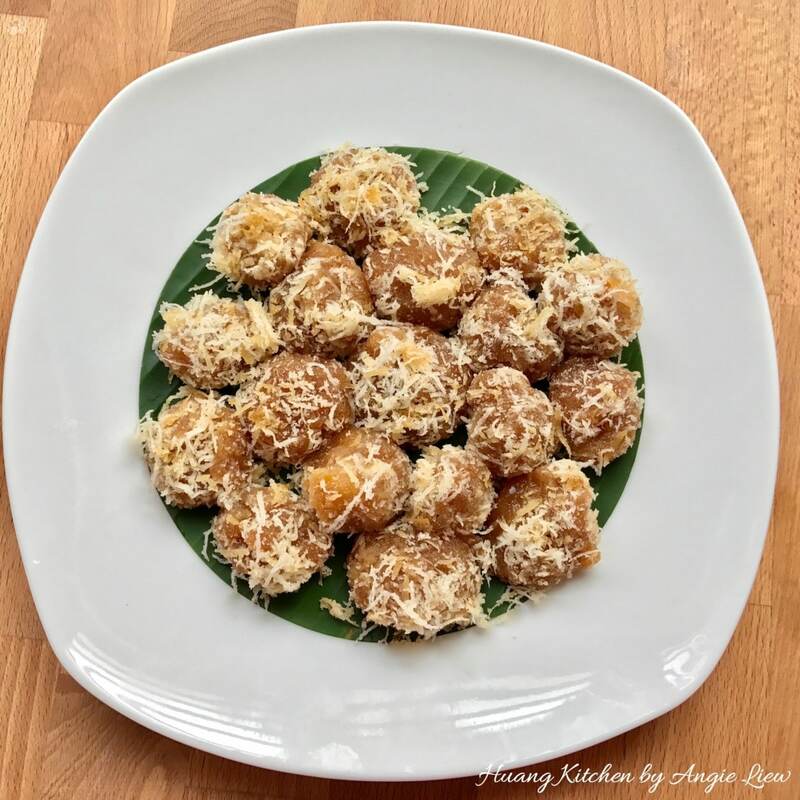 In this recipe, I use freshly grated white coconut and grated coconut that’s been infused with palm sugar. 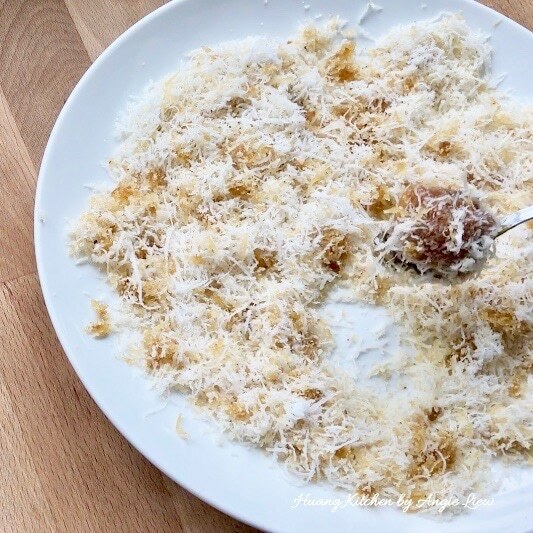 You can choose to use just freshly grated white coconut too and it will still be good. When steamed, nian gao becomes soft and sticky so it is easily rolled and coated in the grated coconut mixture. 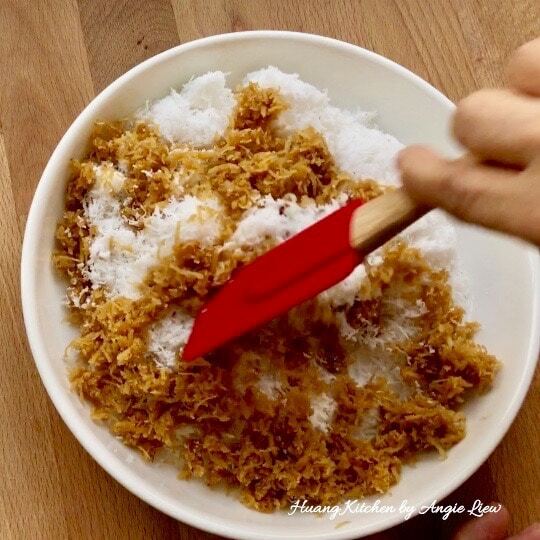 Adding a pinch of salt into the coconut mixture helps to enhance the flavour of the sweet nian gao. 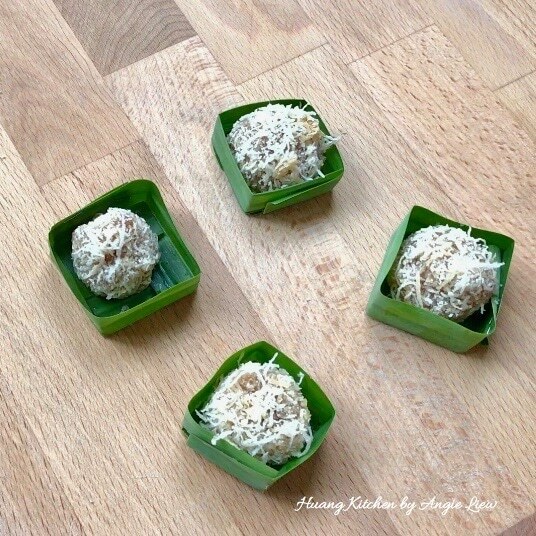 These bite-sized coconut balls resemble Onde-Onde, a very popular Nyonya snack. They may not taste like One-Onde but they certainly taste AWESOME! Steamed nian gao rolled in white and palm sugar coconut. 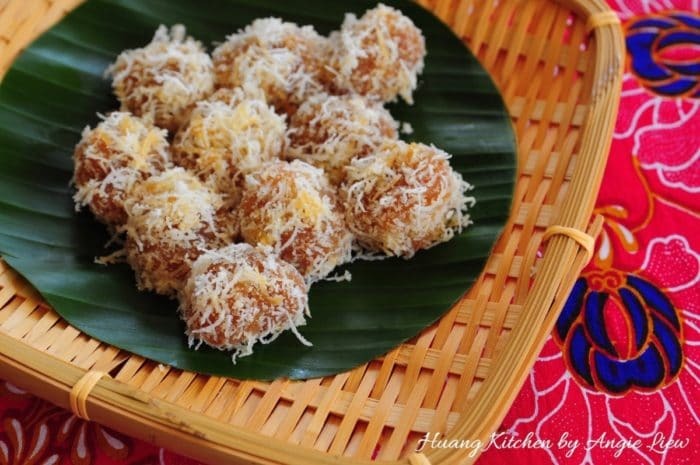 These onde-onde like coconut balls are chewy and sweet, filled with coconut aroma. Truly addictive! Then, cut hardened nian gao into thin slices. Place the nian gao slices on a large, heat-proof plate lined with oiled banana leaf. Prepare steamer by bringing a wok of water to a boil. Place the plate of sliced nian gao into the steamer. Cover with lid and steam on medium heat for 10 minutes. When done, remove the soft and melted nian gao from steamer. Using 2 teaspoons, scape a piece of the sticky nian gao onto one of the spoons. Then, roll it in the aromatic coconut mixture to form into a ball. Toss well to evenly coat the nian gao with the grated coconut. Place on serving plate and repeat the same for the rest of the sticky nian gao. 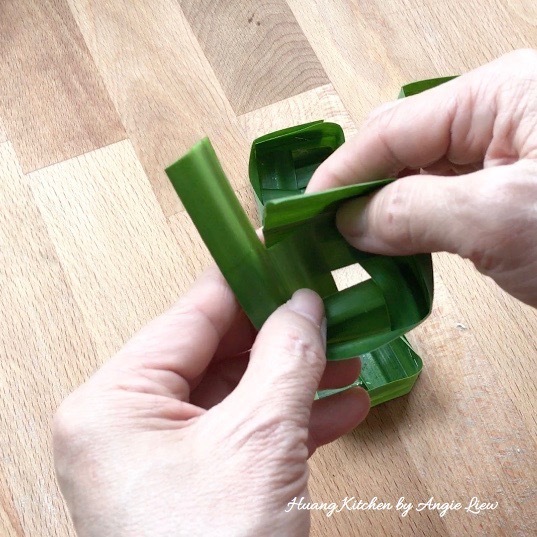 For better presentation, make a pandan leaf casing for the steamed nian gao. Place the coconut coated nian gao into the prepared casing and serve immediately. Best eaten warm with hot chinese tea. As always, ENJOY! 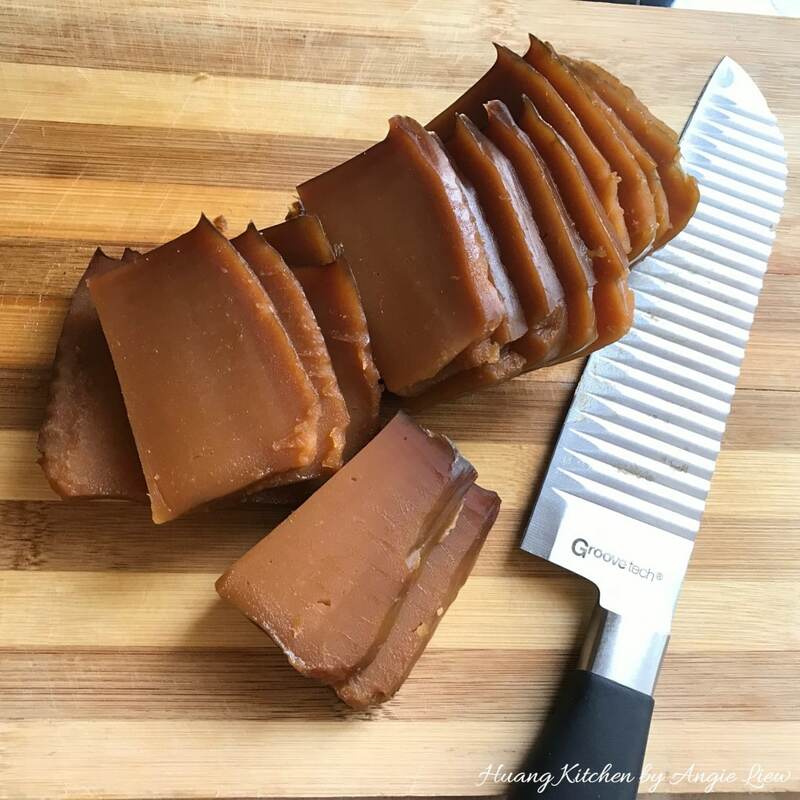 If nian gao is still soft, refrigerate it overnight before cutting as hardened nian gao is easier to slice into pieces. Best to use freshly grated coconut. However, if not available, mix desiccated coconut and salt together and steam for 30 minutes. 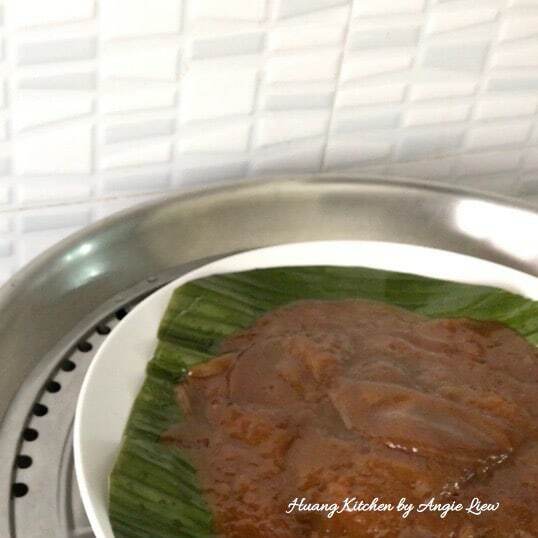 You can also choose to coat the nian gao with only white grated coconut if cooking grated coconut with palm sugar is too much trouble. Lining the steaming plate with banana leaf imparts a nice fragrance to the nian gao. 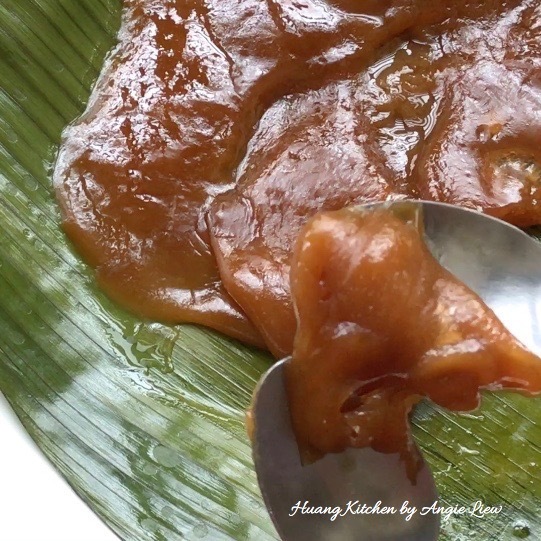 Oiling the banana leaf helps to prevent the steamed soft nian gao to stick to the leaf. Store the steamed nian gao in a container and consume within 2 days at most.